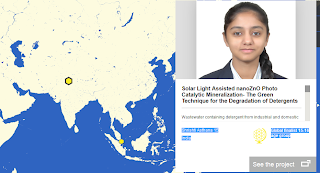 Srishti Asthana, 15, of Chandigarh will showcase her science project, which could be potential green method for treating wastewater containing detergent, at the Google headquarters in the US. Competing in Google Science Fair, 2013, the Class-11 student from The Millenium School, Mohali, is one of 15 finalists chosen from nearly 1,000 contestants across 120 countries. 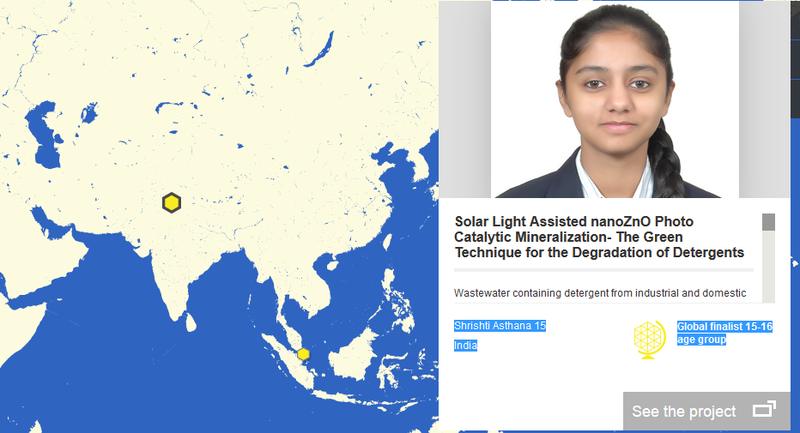 She claims that her project (solar light assisted nanoZnO photo catalytic mineralisation, green technique for the degradation of detergents) has short treatment time, is less costly and has less exposure involved for workers. The idea for the project struck her on a field trip to Ludhiana, when disturbed by the dire state of industry's waste disposal, she asked the textile owners why didn't they find a way to treat the dye water. "They counter-questioned me if there was method to treat detergent water,' she said. Thus began her journey to find a green solution to turn detergent water from industrial waste into an eco-friendly alternative.